Self-assembling nano inks form conductive and transparent grids during imprint. Transparent electronics devices are present in today’s thin film displays, solar cells, and touchscreens. The future will bring flexible versions of such devices. Their production requires printable materials that are transparent and remain highly conductive even when deformed. Researchers at INM – Leibniz Institute for New Materials have combined a new self-assembling nano ink with an imprint process to create flexible conductive grids with a resolution below one micrometer. To print the grids, an ink of gold nanowires is applied to a substrate. A structured stamp is pressed on the substrate and forces the ink into a pattern. “The nanowires are extremely thin and flexible; they adapt to any pattern of the stamp. During drying, the individual wires self-assemble and form larger, percolating bundles that form the grid,” explains Tobias Kraus from INM. The stamp is removed and the grid is treated in a plasma. “This compresses the bundles into conductive wires and results in a transparent, conductive grid. Depending on the geometry of the stamp, this simple method can shape any nano or microgrid,” says Kraus, head of the program division Structure Formation. The thickness of the grid can be controlled via the gold concentration. “Only very small quantities of gold are needed to produce a conductive grid, far less than when using inks with spherical gold particles,” says Kraus. 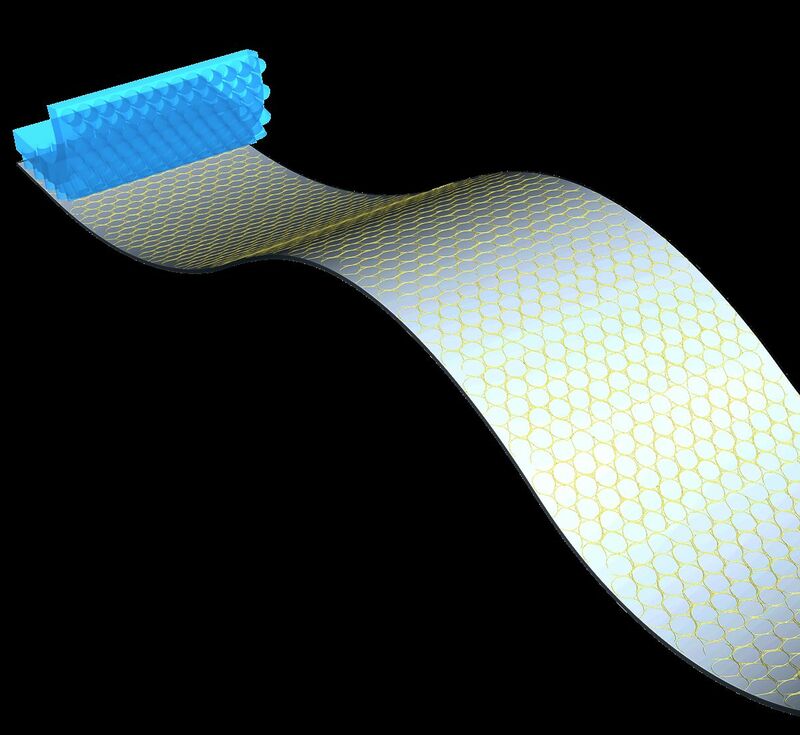 This makes the advantages of gold accessible for flexible electronics. “Our results show self-assembly and imprint can be combined to efficiently produce transparent, conductive materials. We will transfer this insight to other metals in further studies,” says Kraus. INM – Leibniz Institute for New Materials, situated in Saarbrücken, is an internationally leading centre for materials research. It is an institute of the Leibniz Association and has about 220 employees. Nano Letters "Templated self-assembly of ultrathin gold nanowires by nanoimprinting for transparent flexible electronics"